You can’t find your phone for two seconds and you start crying. You think someone looked at you the wrong way, you start crying. The ability to keep your emotions in check just dissipates when you are stressed. Even though it doesn’t help at all, you choose to deal with your problems by hiding away from them by whatever means necessary. 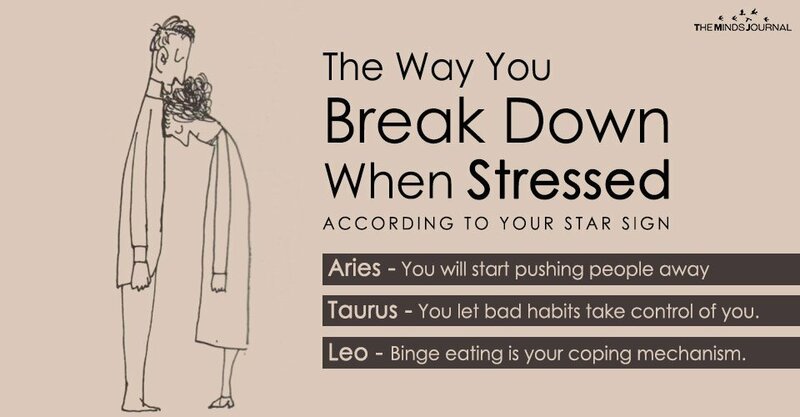 Your coping mechanism from stress is escapism. You prefer fleeing from the situation that causes you stress than apply productive coping techniques that actually work. You stay at home in your night clothes all day. You put yourself away from social contact. You find it easier to hide than to go out and actually do something to solve your issues. When your mental health is low, your physical health also gets shot to pieces. It is almost as if your immune system is only as strong as your emotional state. So when you are pushed past your limits, your body reacts adversely; the crucial physiological processes are hampered as you start showing psychosomatic symptoms like stomach ache, gastrointestinal problems, indigestion etc. At the same time, constant migraines will keep plaguing you. Not a person who can find the silver lining easily, when you’re under stressed, the clouds seem to roll in thicker and darker than ever. You’re usually cynical and slightly jaded but when you are crashing, you become downright cruel to yourself and to everyone else around you. No matter what, you just assume that you’ll see the worst possible outcome so you are never satisfied with the outcome of your works while under constant pressure. Even though you can’t always control the things that go wrong, stress blinds you to this valuable piece of wisdom. You begin to think that you are responsible for the whole world falling apart. You become self-critical being harsh with oneself and implementing a punitive attitude towards self. Whatever you do won’t be enough and you think that you’re incapable of being confident and optimistic. This leaves you feeling frustrated and you let it out by raging at yourself. Crying becomes your major way of catharsis in these times. You feel everything so emotionally that too much stress tends to overwhelm you to the brim. You’ll start looking for hidden corners where you can get enough privacy to let some steam out. Be it in the washroom, at work or in the darkness of your bedroom, you’ll find the time to just sit down and sob, clearing up your pent up emotions. While it helps you to let it out, it is also counterproductive as that’s all you’ll feel capable of doing. Stress and anxiety are monsters that blind you to all the wonderful things happening around you. Especially for those who tend to be workaholics. Ignoring your mental health is a strict no because the longer you keep these things tucked away inside you, the harder you’ll crash and burn when your mind and body give up on you.